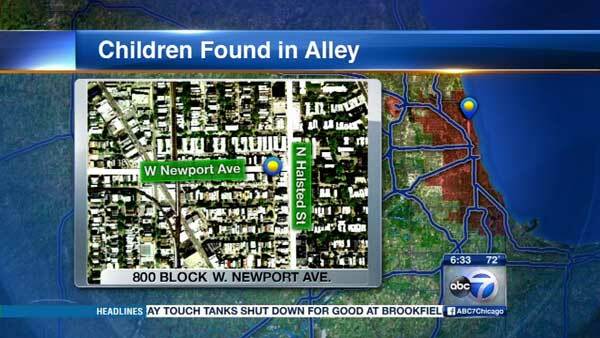 CHICAGO (WLS) -- Two young children were found in an alley in Chicago's Lakeview neighborhood, officials said. Police said someone found a 5-year-old girl and 4-year-old boy in the 800-block of West Newport Avenue around 11:45 p.m. Monday. Officers located their father in a home on the same block. The children were taken to Advocate Illinois Masonic Medical Center in good condition. The Department of Children and Family Services is investigating. No one was charged in this case.